This post is an unusual one in its subject as it is a response to a well thought out post I read recently authored by Michaela Stephens at her blog Scriptorium Blogorium In it she discusses an interesting symbolic act by the prophet Jeremiah found in Jeremiah 13:1-11. In this section Jeremiah is told to get an item of clothing and wear it, but not wash it, then bury it in the earth and display its corruption. He then explains several symbolic meanings of the garment and his act. Verses 1-11. - The entire people of the Jews is like a good-for-nothing apron. Verse 1. - A linen girdle; rather, a linen apron. "Girdle" is one of the meanings of the Hebrew ('ezor), but is here unsuitable. As Ver. 11 shows, it is an inner garment that is meant, one that "cleaveth to the loins of a man" (in fact, περίζωμα of the Septuagint, the lumbare of the Vulgate). The corresponding Arabic word, 'izar, has, according to Lane, the meaning of "waist-wrapper.' Israel was to Jehovah in as close a relation spiritually as that in which the inner garment referred to is to him who wears it materially. There is an Arabic proverb which well illustrates this: "He is to me in place of an 'izar" (Freytag, 'Studium der Arab. Spraohe,' p. 298). "A linen apron" may perhaps be specified, because linen was the material of the priestly dress (Leviticus 16:4), and Israel was to be spiritually" a kingdom of priests." But this is not absolutely necessary. The common man used linen in his dress as well as the priest; the only difference between them was that the priest was confined to linen garments. But an ,' apron" would in any case naturally be made of linen. Linen; literally, flax (a product of Judah, Hosea 2:5). Put it not in water. The object of the prohibition is well stated by St. Jerome. It was at once to symbolize the character of the people of Israel, stiff and impure, like unwashed linen, and to suggest the fate in store for it (Ver. 9). The suggestion that the garment was an apron was of interest to me and came as a bit of a surprise. While I follow the line of reasoning and remain open to the possibility, I am not entirely convinced. The strongest argument for apron seems to be the use of linen reflecting priestly dress, and certainly I think there is significance there. Instead I think the text most strongly implies an innermost garment. W. Robertson Smith made an interesting study of the word in the Jewish Quarterly Review in 1892. It is older but definitely worth a read. The word ezor clearly has cultural meanings that are not obvious or clear. In Job 12:18 it is used a symbol of Gods power over kings. Smith argues that it may have been the garment of a slave or captive. The king is removed from his splendid robes and left only with this simple garment. The prophet Elijah in 2 Kings 1:8 is noted for his use of this undergarment although his was made of skins. Isaiah uses it in Isaiah 11:5 as a symbol of faithfulness and righteousness. 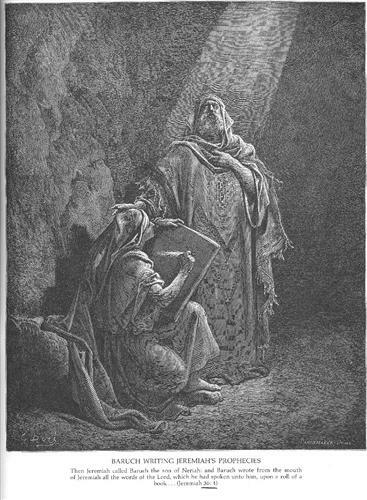 In our reference text of Jeremiah it is used as a symbol of the closeness between Israel and God and explicitly references the Abrahamic covenant that they would be his people, and receive a name, and a praise or manner of worship, and glory, but just as Jeremiah did not properly care for his garment, the house of Israel would not hear the commandments of God. Admittedly, such symbolism associated with a common article of clothing may strike a modern reader as odd. Such lofty meaning would more naturally be associated with an embroidered coat or a splendid crown rather than a humble loincloth. Yet to the ancients it seems this symbolism resonated in a way that is not well appreciated. To Latter-day Saints such symbolism in plain and simple things may have an odd familiarity. Thanks for explaining this. I see that the symbolism is richer than one would think. It does have a familiarity. And this has given me some new things to think about. Great post. I like your blog and will subscribe. Raised in Alabama, Educated at BYU, Married father of four. Proud to be a part of Utah.